We have launched our new price optimization website www.smart-pricer.com. As a conclusion, we share our experience in pricing and ticketing optimizations. The new website provides a comprehensive overview of our pricing and revenue services. Furthermore, it offers convenient options to stay in touch with us. We focus on easy navigation through our content. Furthermore, we also provide our Resources in form of White Papers, Blog Posts, and Press Release. They serve to guide visitors through our pricing news and specialized knowledge. 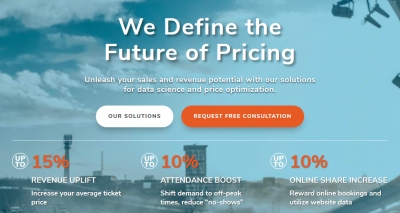 What’s more, the new price optimization website includes extensive product information to help customers understand Smart Pricer’s complete range of pricing solutions. Technical data, videos and application case studies work together to provide a detailed overview of our capabilities. Those come across a wide range of industries, including cinema, sports, entertainment, parking, and ski. In addition to that, we help to make our vast portfolio of services and resources easy to browse in the new FAQ-section. Those are placed on the Homepage and on every industry site. Our FAQ-Sections cover the most important questions regarding the implementation of a smart pricing strategy. They are tailored to every industry needs and are updated regularly. Moreover, we clearly demonstrate our mindset, to not only sell our software, but be the long-term partner for our clients. Therefore, we develop lasting price optimization strategies and continue to improve them through workshops and constant challenge of the status-quo. All in all, the new website allows visitors to benefit from richer online content that is easier to navigate and share with others. This is a result of talking with customers and gaining valuable feedback. The price optimization website has been designed with the user experience and educational mission in mind. It is best compatible with today’s browsers and mobile devices. After you checked the new website, why not give us your feedback by posting a comment on our LinkedIn or Twitter page. Don’t forget to subscribe to our Newsletter to be the first to know about new Publications and Content.